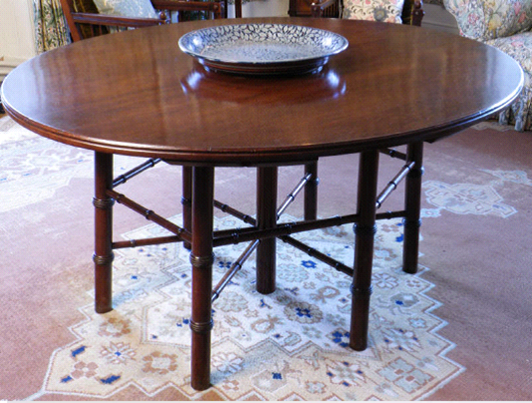 This oval mahogany table is one of our House Steward’s favorite pieces in the house. Designed by Phillip Webb, the table is supported by 7 legs —a central thick leg and 6 thinner legs with rounded bulb like decoration. The thinner outer legs have thin bamboo like side stretchers or connections halfway down whilst similar stretchers connect the central leg to the 6 outer legs. All in all, it is an incredibly well-balanced table with all the legs touching the floor. Phillip Webb was both a designer of furniture and an architect. It was him who designed Standen right down to the littlest of details, like the picture hooks. 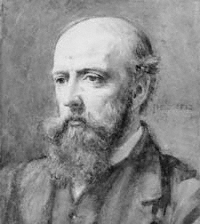 Webb trained as an architect in Reading and Oxford. Whilst he was training under G.E. Street in Oxford, he was put in charge of a new apprentice, William Morris, and thus began a life long friendship. Morris soon changed his direction and became a designer. Webb was one of the original founders of Morris’s company, Morris & Co, and soon started producing furniture designs for the firm. Even after Webb resigned, he continued to recommend Morris & Co to his clients, as he did with the Beales at Standen. Categories: Uncategorized | Tags: Architect, collection, designer, Furniture, G.E. Street, House Team, Interpretation, National Trust, object, Object of the Month, Oxford, Phillip Webb, Table, Webb, William Morris | Permalink.